Things are looking pretty desperate for Britain's crude producers. 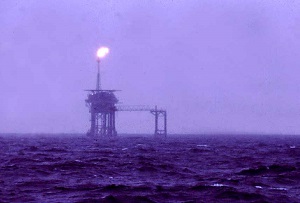 ‘We are an industry at the edge of a chasm,’ Deirdre Michie, the boss of lobby group Oil & Gas UK warns in the foreword of a report published today. Things have certainly taken a turn for the worse as the price of oil plummeted over the last 18 months or so. The sector’s producers are slashing jobs and investment and there are few signs of renewed buoyancy in the price of crude. Today’s report doesn’t exactly fill a reader with joy either. Revenues dropped 30% last year despite a 10% increase in production, it says. This year ‘upstream’ producers will spend less than £1bn on new projects compared to a typical annual spend of £8bn over the past five years. More than two fifths (43%) of oil fields are expected to operate at a loss in 2016. The situation isn’t looking great, but there’s another reason behind the sombre language. The Budget is little more than three weeks away now and all of the country’s lobby groups are keen to press George Osborne to throw them a bone. The North Sea could certainly do with a break. But with his borrowing targets under threat and other industries, not least steel, demanding his attention, Osborne will have to get creative with his figures if he wants to keep everyone happy.